This tip should almost be at the beginning of the list, but it is fine here. Simple tip: Get one, and don’t forget it. As far as I know, no state offers a ‘ice fishing only’ fishing license, and that means that your license will only be good until the start of the next fishing season, which is often April 1st of the following year. (Some may be March 1st, or some other date.) 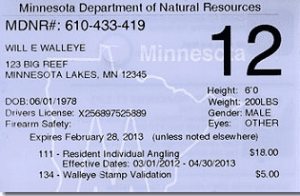 If you are going early in the ice fishing season, then you really don’t need to worry when the fishing license expires, but later in the season you will need to be aware of the expiration date of your license. The important thing is that you need to have a current license. Now some states will allow an electronic copy on your cell phone, but just to be sure, make sure you have an official license in your possession. I often print out a really tiny version (the size of a credit card) and use that. If they have any questions, certainly the electronic version on your phone will work.